The presence of your own feline friend or a special therapy cat can actually help you feel better as you recover from cancer treatments, improving your quality of life. Animal-assisted therapy is a type of complementary treatment used with hospital patients, including those suffering from cancer. Not only do therapy cats provide a sense of comfort for cancer patients, but they can actually improve both their physical and psychological health. According to a study published in the October 2009 issue of the "Journal of Clinical Oncology," patients with cancer experience major depression and anxiety. Such negative emotions stress the body and can have an adverse impact on a patient's health and recovery. Animal-assisted therapy helped young cancer patients feel less fearful, decreased their emotional distress, provided them with a distraction from painful treatments and increased their feelings of pleasure. . 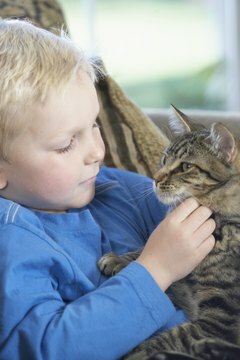 The presence of a beloved pet cat or even a calm therapy cat can reduce your perceived level of pain. According to the "Current Pain and Headache Reports," of August 2012, animal-assisted therapy can help patients dealing with pain, such as cancer patients experiencing pain from their disease or the treatments for it. Young patients dealing with pain showed a significant reduction in their symptoms when exposed to therapy pets. Having a kitty by your side when you're in pain provides you with a pleasant distraction to concentrate on, instead of your discomfort. The presence of a cat for cancer patients can actually produce positive physical changes which can aid in recovery. An article published in the 2003 edition of "Current Directions in Psychological Science" examined how the presence of pets can help lower blood pressure in stressful situations. Another study in 2007 showed that the presence of a therapy cat helped increase the arterial oxygen saturation in patients receiving chemotherapy treatments. Such physical improvements not only help improve a patient's health, but also reduce fatigue, speeding recovery and encouraging patients to adhere to their treatment regimens. Unfortunately, not all cancer patients can have the presence of a cat near them to help with the healing process due to their suppressed immune systems. One such patient was given a slide show of 3,000 cat photos to look at while isolated after a bone-marrow transplant. Just the pictures themselves seemed to cheer up the young girl, who missed her own pet cat. For those who are separated from their own cats, therapy cats can help fill the void when cancer patients are hospitalized. These cats must pass strict tests on their temperament, health and cleanliness, making them appropriate to visit environments like hospitals.